What’s an HTTPS Certificate and Why Do You Need One? In the coming months, Google is hoping to make HTTPS the internet standard by highlighting sites that use HTTPS and shaming those that don’t. The new version of Chrome coming in July is going to make any website that is not secured with HTTPS and SSL certificate obvious, flagging it as dangerous and unprotected. If you’re still using the regular old HTTP, now is the time to upgrade to the security of HTTPS. But what is HTTPS, and what are these SSL certificates everyone is talking about? With Google being a leader in defining industry standards across the internet, it’s obvious why many sites are prepared to play ball. What is it going to mean for your dealership if you don’t use HTTPS? In short, the “s” stands for “secure;” it’s as simple as that. But why is HTTPS secure when it’s sibling HTTP is not? 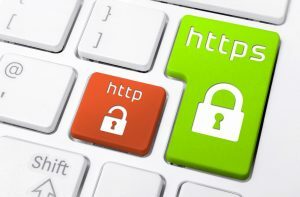 If your website has HTTPS in front of your URL, that means your site uses a protected, encrypted connection. By encrypting information, you are protecting your users’ sensitive information (while also improving search engine optimization, too). HTTPS is actually a set of protocols working in tandem to make sure your site protects users’ data. HTTPS works because of one key element: Secure Sockets Layer (SSL) certificates. An SSL Certificate is a method of encryption that works by acquiring verification from an SSL provider, after which you install the certificate on your site. It offers a secure way to send encrypted information between a server (where your website is hosted) and a user’s browser. SSL certificates use public key cryptography, which makes any and all information sent from your site to a user’s browser completely illegible to a third party intercepting the data. This includes usernames and passwords as well as other information. An SSL certificate is a data file given to your site by a trusted provider. It’s embedded in your website’s root directory and, in essence, informs visitors that you own the site and you are who you say you are. It also provides the cryptographic key that encrypts web traffic to and from your site. Visitors will know your site is using SSL certificate encryption by the green padlock next to the URL. There are two main reasons why you need HTTPS: One, it’s secure, and a secure internet is a safe internet, meaning you’re capable of doing your business, providing security to your customers, and staying relevant in the evolving digital age. Customers who feel uncomfortable with your site are more likely to search out a competitor that offers better security. Secondly, Google and other search engines prioritize HTTPS sites over HTTP. This includes how high up your site appears when someone conducts a search. As you probably know, very few people bother clicking over to even the second page of a Google result, so ensuring your site shows up on that first page is critical. Without HTTPS, that’s incredibly difficult, and come July and the new Chrome update, for all intents and purposes, it’s going to be impossible. Google is encouraging HTTPS with the old carrot-and-the-stick approach: By using HTTPS, you are creating goodwill with your clients and filling them with confidence, which is an important task for every dealership looking to sell a vehicle. The stick is that, without HTTPS, your site is going to be buried under dozens, hundreds, and thousands of sites that do use it. You can choose to contribute to a safe internet and continue to do great business online—or slowly fade away. Find a quality partner to help with your upgrade, and your business’ digital future will be secure.